I was sent a pair of Ox Straps Hammock Straps earlier this year to review and test. These straps are wide, durable, polyester-based straps used to create an anchor point for hanging a hammock. The come sewn with steel O-rings on one end and include locking steel carabiners and are ideal for backyard hammocks. The Ox Straps Hammock Straps are very durable, made from a thick polyester “seatbelt”-style webbing strap. The end loops are sewn with a twist, which can help make it easier to open and connect hardware or line. 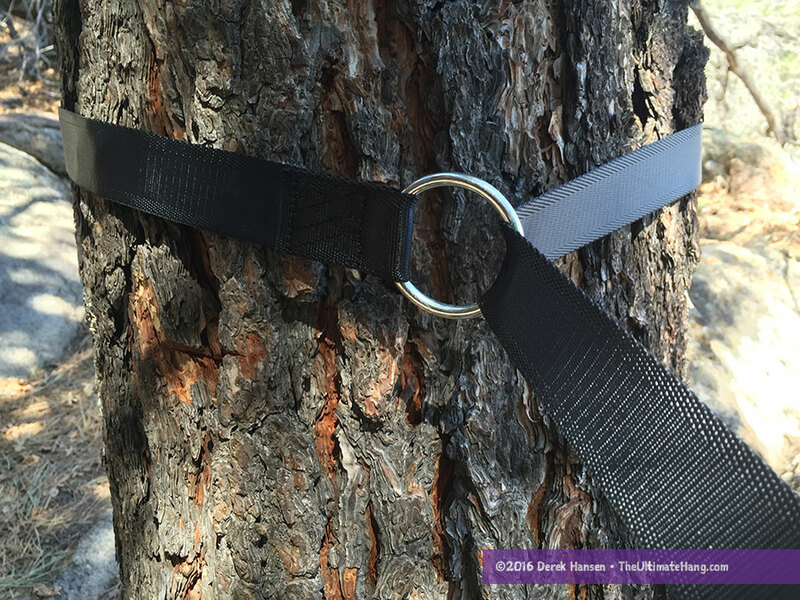 A steel O-ring is sewn on one end of each strap, and is used to make it even easier to thread the strap back through itself when you wrap it around a tree or other potential anchor point. The strap set comes complete with a pair of steel locking carabiners. What I like most about these hammock straps are the width of the webbing and the durable material used. These straps are very robust and I wouldn’t hesitate to use them in a variety of locations including over rough rocks. The inclusion of the O-ring does make it a little easier to thread a strap, and it does reduce friction-based burns common with synthetic straps; however, the hardware adds weight that may not appeal to campers looking for a lighter solution. The addition of the locking carabiners is a nice touch, and for a semi-permanent clip, they work okay. These style of carabiner are cheap and common with hammocks these days, but I really do not like them for a few reasons: they are more difficult to open; the gate doesn’t open very wide, making it hard to fit straps inside; the clip frequently snags on the “tooth” of the carabiner; at 3.2 ounces each, they are heavy. This style of strap doesn’t provide an easy adjustment like are common now with daisy-chain-style straps. In order to adjust the length and allow you to use the end loop, you’ll need to wrap the strap one or more times around the tree before threading through the O-ring. This method isn’t going to work in every situation since tree diameters vary. With a single pass with this strap you could tie a simple Becket Hitch at any point along the webbing, or use a Marlinspike Hitch. In the past year there have been dozens and dozens of companies coming out with hammock straps that it is difficult to really make any comparative list. A quick search on Amazon.com reveals plenty of options to do some comparative shopping. $50 bucks? Hmm I will check the Amazon link, also I think, correct me if I’m wrong, tree huggers are a lot cheaper. I have not checked in some time.